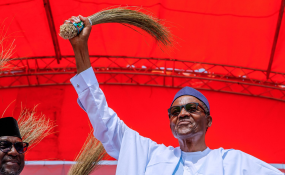 President Muhammadu Buhari has warned politicians against resorting to violence ahead of Saturday's Presidential and National Assembly Elections, saying that he is not an apostle of bloodshed. The President gave the warning in Southern Kaduna, during the women conference of the First African Church Mission, held in Zuturung, Gada Biyu, Zango Kataf Local Govt Area, with the theme: "I will help you". Represented by Nigeria's Ambassador to the Republic of Congo, Deborah Iliya, the president called on the people of Southern Kaduna to support his re-election, saying; "I am not an apostle of bloodshed, no, I am not available for violence." Buhari appreciated the leadership of the Church for their invitation and reiterated his commitment to creating a more conducive environment for the citizenry, saying, "we are one big family." Speaking in her personal capacity, Mrs Iliya said; "I believe that your prayers will give your leaders the power towards their numerous efforts to improve the lives and well-being of all Nigerians irrespective of their religious beliefs or creed. "The President has told me to inform you that he sees human life as sacrosanct and will do everything to protect lives and properties. Try to live in peace and harmony with one another and avoid anything that could bring trouble. "The President is a man of peace and bridge builder. Though he has been greatly misunderstood by many because of his fight against corruption, but he means very well for Nigeria, he is a respecter of every religion and tribe". Also, at an awareness rally/launching of APC Campaign Support Vehicles in KPOP HAM Palace Ground, Kwai in Jaba, Southern Kaduna, Iliya said; "Those who sponsor and perpetrate violence in the 2019 elections, no matter how highly influential, will face the law. Let me also say that Nigeria is our country, we do not have any other place called Nigeria. This country will not be sacrificed on the altar of violence. "Our youths are the leaders of tomorrow and so, they must shun any invitation meant to use them for violence. As you all prepare for the general elections, please come out, cast your votes. Do not exchange your Permanent Voters Cards for money. Your PVC is your power, come out, exercise your franchise and ensure your vote counts."